I love my new mouse! He’s so tiny and quick. But I don’t think that was the entire problem. I still had Windows Movie Maker shut down on me during production tonight. Luckily I had a whole heck of a lot more work saved this time. And while I would love to upgrade to a Mac, probably what I need to do is just clear a lot of memory for this old laptop. So here it is just a tad past midnight my time, but you can be sure that the majority of this work was done on the 30th. It was a lovely day off! Out by Faylor lake, along the woods with Walt Whitman and the birds. There were two Osprey, a Broad Wing Hawk, half a dozen Eastern Bluebirds, a Cormorant, a snipe, a pair of Horned Grebes, a Baltimore Oriole, as well as the regular cast of Red Winged Black Birds and Canada Geese and Chickadees. All that grand company, and poetry too! I chatted with some fishermen about an eagle they had seen. He didn’t show for me. I had lunch at the counter of a little restaurant in Beaver Springs, next to a retired veteran, and we discussed the serious topic of coffee versus cappuccino. And on one of the winding roads, I passed an old Amish man in his horse-drawn buggy. He waved at me from behind his big bushy white beard and was the spitting image of those photos you see of Whitman as an old man. Years ago I had a professor who argued that Walt Whitman was the father of modern American poetry. With his words about armpits having an “aroma finer than prayer,” he pretty much “unscrewed the doors from their jambs,” and made it possible to write about absolutely anything. Have you read some of the stuff American publishers were selling and calling poetry around the time Miss Emily Dickinson and Uncle Walt came on the scene? Tragic stuff. I mean it was bad, so much predictable garbage being cranked out. So I thought if he was the father, then like it or not, I am one of his sons. I was looking for a new screen name at the time, and thus SonofWalt was born. I know this is a long poem, but it’s worth reading. I know the lists and catalogs go on and on, and even though I left them out of this video (it was already over 11 minutes long! ), they too are worth reading. Seriously, you’ve wasted your time on Twilight, haven’t you? You have, haven’t you? Tsk. Tsk. I came to terms with Walt long ago, and while, like any parent, he sometimes embarrasses me with some of the things he says, I am proud to be one of his sons. I owe him quite a debt, and so do you. As for the text. I only picked out a few parts here and there. Do yourself a favor and pick up the book. You’ll be glad you did, and if not, well, it’s one that should be in your personal library anyway. What a wonderful walk through of Walt Whitman’s Song of Myself. I’m glad I am still up. I love the commentary you allowed yourself throughout the filming. The scenes are magnificent and I now have a renewed tasking. Go back out into nature (not just the back yard) with pen and paper in hand. Once again, an inspirational reading, I’m sure Walt would be proud. Awesome! Thank You! Thanks for a fun and rewarding month! I look forward to sharing more on poetry, and writing in general, beyond the month of April. Yeah, me too! Ugh. 🙂 Nap after work will be called for. I loved the whole beautiful video and the interesting commentary. (I wondered how the name ‘sonofwalt’ had been birthed). What a finale……!!!!! Thanks for the pingback. Much appreciated. And I thoroughly enjoyed your post!! When I was young and just getting into poetry, I didn’t like Walt Whitman at all. His long, long lines and lack of form, his prose-like verse, made me think he had no talent. It took me several years to come back to him, and it was Ezra Pound, actually, who made me give Whitman a second chance. I have detested you long enough. I am old enough now to make friends. 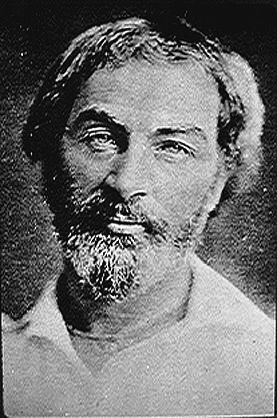 When I returned to Whitman, I found a lot to love, and Leaves of Grass has been long at home in my library. I have a similar story, and Pound’s poem inspired one of my own. Perhaps I’ll post that. LOVE your recommendation ~ inspired because I recently did start rereading it. A mouse! Yikes! HI David. Just thought I’d let you know that I have written about you on my blog today. (http://wp.me/pZ5m8-LY ) Hope it is OK. If you don’t like anything let me know and I will change it. It pretty much says what I think about the 30 Days project…… Thanks! I am am honored, Suzie. Thank you! I’m heading over to check it out now. I am sure I will love it.